A look at what is being identified on Reddit as the frozen meat from a McDonald's McRib. The Northeast's first snowfall is a sure sign of winter, but there's another signal that McDonald's fans look forward to: the return of the McRib. 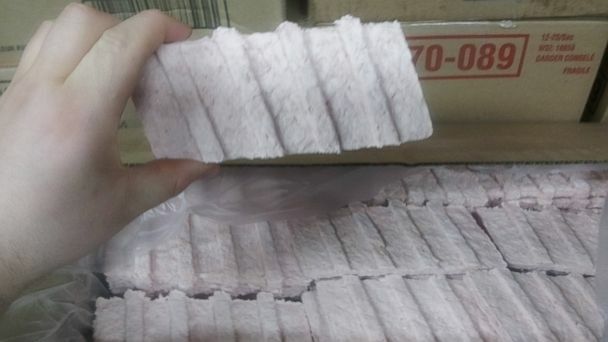 Cover your eyes, though, if you plan on enjoying one sometime soon, as a photo recently surfaced on Reddit identified as the frozen version of the McRib meat. What's usually seen as the cult favorite pork rib sandwich slathered in tangy barbecue sauce and topped with slivered onions and sliced pickles on a hoagie-style bun is completely unrecognizable in this picture trending online. When asked for confirmation that the white hunk is indeed a McRib, McDonald's provided this statement: "There are few things more legendary at McDonald's than the McRib. It is a boneless, seasoned pork patty on a bun with slivered onions, two dill pickle slices and plenty of our sweet, smoky, barbecue style sauce. One reason our customers love the McRib is its fun and wonderful shape. Just like a burger patty is formed to be round and flat, we form the iconic McRib in the shape of traditional ribs. We then flash freeze the patty to seal in flavor and freshness, just like you freeze meat in your own freezer, before going to our restaurants. The McRib is also known for its iconic taste, which is why we use a quality cut of pork - pork shoulder - to give our McRib lovers a thicker, meatier McRib experience." A meaty experience it may be, but at nearly 500 calories, 10 grams of saturated fat, and a whopping 890 milligrams of sodium it's not the most healthful thing on the menu. For context, that's nearly all the recommended amount of sodium intake per day, according to the Centers for Disease Control and Prevention.